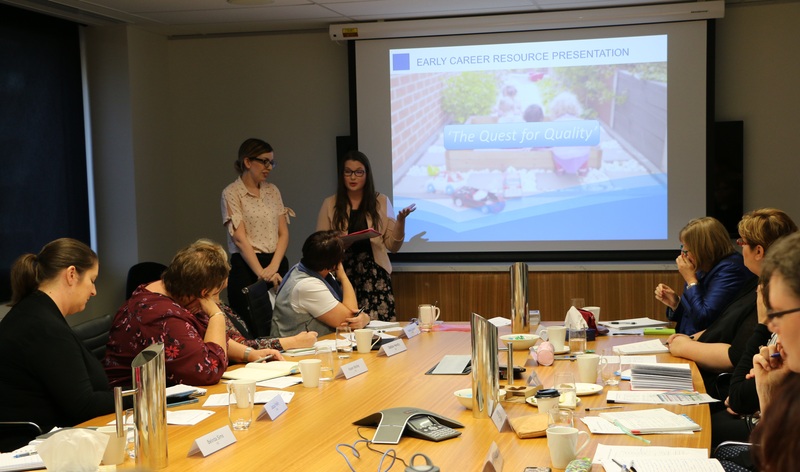 In January 2017, Delana Murdoch, Rebecca Mahoney and Sally Burt joined ACECQA to participate in our Early Career Educators Program – an initiative that provides a work and development opportunity for new early childhood teachers. As part of the program, Delana, Rebecca and Sally have been contributing to a wide range of ACECQA’s educational leadership activities and participating in on-the-job and structured learning. The three educators spoke to We Hear You about their experiences in the program as well as their career goals and ambitions. Delana: Hi, my name is Delana, and I have recently graduated from the University of Wollongong with a Bachelor of Education: The Early Years (Birth – 5 years) degree. 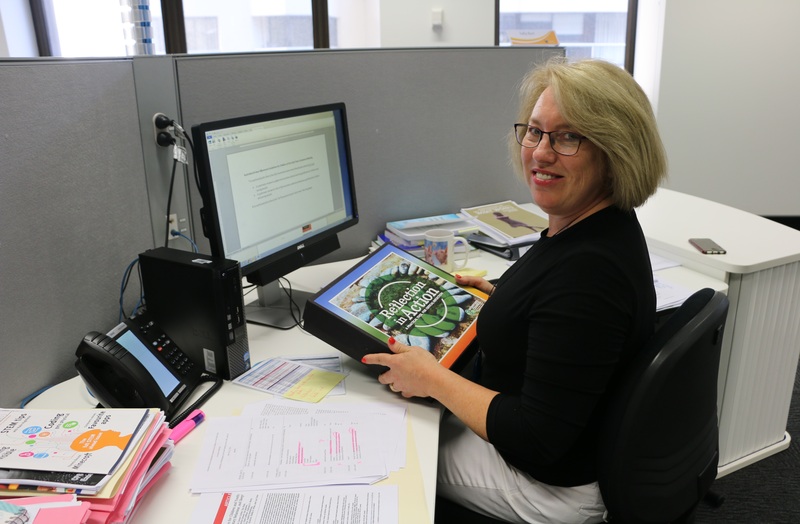 Having enrolled in university directly after high school, working at ACECQA has been my first role in the children’s education and care sector. Rebecca: Hi, I’m Rebecca and I’m from Ballarat, Victoria. I have worked in the education and care sector for over 10 years, and have two beautiful young children of my own. I am currently completing a Bachelor of Education (Birth – Year 6), and will graduate at the end of 2018. Sally: Hi, I’m Sally. I recently graduated with a Master of Teaching (Early Childhood) from the University of Sydney. My professional background is as a dietitian-nutritionist, working for 20 years in nutrition education and public health. My ACECQA role is part time, as I currently work two days per week as an Early Childhood Teacher (ECT) at a community preschool. D: My ECT mentor Eliza tagged me in the advertisement of the position on Facebook. R: I stumbled across the advertisement for the educational leadership assistant position on the ACECQA website while filling out an expression of interest form for ACECQA’s 2017 Temporary Employment Register. S: My University of Sydney Program Director forwarded the advertisement to our class. I also saw the opportunity promoted on the ACECQA Facebook page. What were the highlights of your experience at ACECQA? D: While there have certainly been many highlights throughout this experience, one of those being the development of the innovative resource The Quest for Quality. Another one of my favourite parts of the program has been shadowing the assessment of Excellent rating applications. It is truly inspiring and fascinating to hear about the unique and high quality practices of those applying for the rating. R: One of the highlights for me has been experiencing a work environment so different to the education, care and school environments I have worked in during my career. It took me a while to get used to the idea of a workplace without a sandpit, and a workday that didn’t involve singing, cuddling and cubby-building! S: A definite highlight has been the opportunity to gain ‘hands-on’ experience within the Educational Leadership team, such as writing a We Hear You blog, sitting in on an Excellent rating assessment teleconference, and supporting the development of authorised officer training resources. Being personally introduced to esteemed leadership academic, Manjula Waniganayake (who was visiting ACECQA), at the very moment I was using her work in some educational leadership research content, also absolutely stands out! What new knowledge did you gain during your time at ACECQA? D: My knowledge and understanding of the National Quality Framework (NQF) and ACECQA’s role in the sector has grown extensively. The development of The Quest for Quality game required us to delve into the National Quality Standard (NQS), the National Law and Regulations, the roles of ACECQA and the regulatory authorities, the approved learning frameworks and much more. If you want to develop your own understanding of integral components of our sector in an enjoyable and engaging way, be sure to check out The Quest for Quality! R: I see my time at ACECQA as something of a crash course in the NQF. I dug deeper into the NQS, the National Law and National Regulations than I ever thought possible, and have such a better understanding of ACECQA’s role and the Australian education and care sector. The people at ACECQA are so lovely, knowledgeable and passionate about promoting quality education and care in Australia that you can’t help but become incredibly inspired yourself! I hope this inspiration will translate into the resource we helped create – The Quest for Quality. I’m really looking forward to hearing some feedback from those working and studying in the sector. S: Inductions across the organisation introduced me to the critical work undertaken by the ACECQA Training, Communications and Engagement, Policy and Strategy, Research, Qualifications Assessment, Business Communications and the Education and Care Services team which is responsible for the National Quality Agenda IT System. I now have a much greater understanding, and appreciation, of the breadth, depth and dynamics of ACECQA’s work, particularly during this time of change. What was the most challenging facet of your experience at ACECQA? D: The most challenging part of the program was the lack of children in the office environment! It was definitely quite a change to be interacting with adults all day instead of children. R: The most challenging aspects for me were the logistics of temporarily relocating to Sydney from regional Victoria and being apart from my family for the first time. However, I knew working with ACECQA was a once-in-a-lifetime opportunity, and the experience would be well worth the challenge! S: Working at ACECQA three days a week, and in a preschool for the other two, has required some brain plasticity as I transition between the two roles each Wednesday! That said, each role has been a wonderful context for my work in the other. How will your time at ACECQA inform your future practice or career aspirations as an ECT? D: My time at ACECQA has given me a wealth of knowledge and experience that I plan to translate into my future practice in early childhood education and care settings. I also plan to share all I have learnt with my fellow educators in the sector. And who knows, maybe my future involves developing more game-based resources for the sector! R: I look forward to putting the knowledge and skills I have learnt at ACECQA to good use in my future studies and practice as an educator. I am very proud and excited to introduce The Quest for Quality resource to my university lecturers, fellow educators and students. S: My ACECQA experience has definitely been formative for my current ECT practice, giving me a much greater depth of understanding of the NQF. My working knowledge of the NQS has grown exponentially and I now have a much greater appreciation of the complex work authorised officers undertake. I have also been really inspired by the exceptional programs and practices of Excellent rated centres. The experience has cemented my interest in working at a strategic support level in the longer term. If the program was run again, would you recommend this opportunity to other graduates? D: The Early Career Educators Program provides you with an experience incomparable to any other. The learning and growth you experience in a three-month period can dramatically change your understanding and perception of the education and care sector in a number of ways. Regardless of the career path you wish to take after your time at ACECQA, the knowledge and experience you have gained will further equip you to contribute to positive outcomes in the sector. R: This truly is an unprecedented learning experience for those working or studying in the sector. You gain such an immense amount of knowledge, inspiration and experience in a relatively short period of time, and get the chance to work with some of the loveliest people and informed professionals in the Australian education and care sector. S: Echoing Delana and Rebecca’s comments, this program offers graduate teachers a golden, once-in-a-career opportunity. Post-university, when you are full of enthusiasm but a little lacking in confidence, this provides an intensive ‘summer school’ internship-type opportunity where you will have access to the very best human and professional resources, undertake meaningful projects, be inspired and learn so much! Graduates should not hesitate to apply. The Quest for Quality game, which has been developed for children’s education and care services, explores the seven quality areas in the revised National Quality Standard through sector specific knowledge. The Quest for Quality was designed as a capacity building tool and provides educators an opportunity to integrate an element of fun into their professional discussions and critical reflection. The Quest for Quality game is available for purchase or as a free download on the ACECQA website.